It has been a while! Basically because I needed to get sorted out with two things which really needed to be cracked at this stage. The first one was how it was going to be displayed which needed quite a bit of thought and figuring out. The second one was working out what bits and pieces of plastic I would need to do the detailing and the display. I wanted to get this sorted before ordering as EMA Model Supplies have a minimum order charge and I didn’t want to find out I needed something else straight away. So figured that out and have now got the stuff. And back to it. Although it doesn’t look like much sorting out the tunnel (which is the cold helium and electrical umbilical tunnel) which runs up the side of the first stage took me about 2 hours. 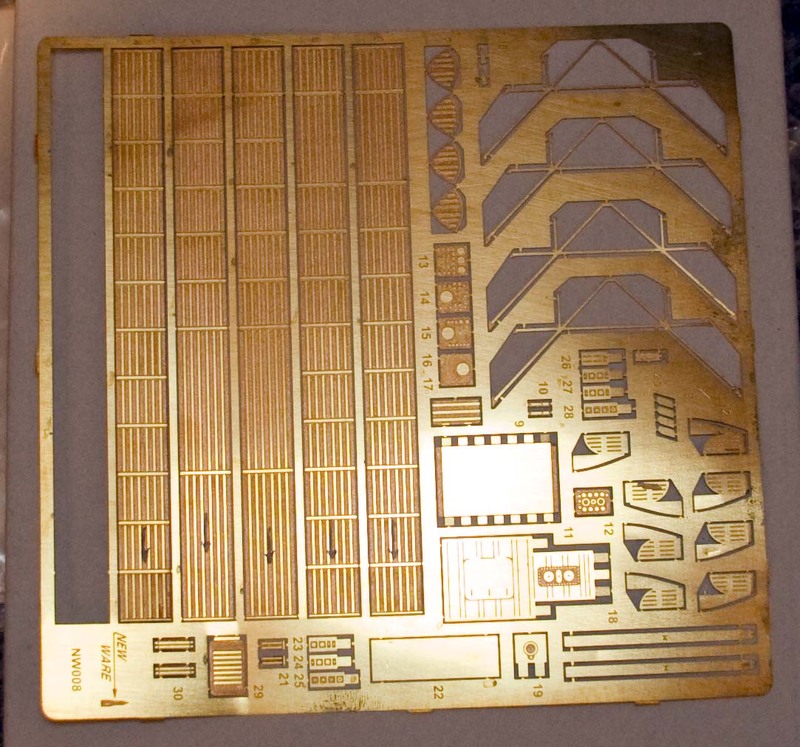 This is made up of 3 long pieces of photoetch which form the half round part and 2 pieces which make up the end caps. These are formed around a piece of 6.4mm half round (which was a perfect size) instead of the kit part, which is too high (basically the half round part on top of a 2-3mm raised section). It doesn’t fit perfectly to the body and will need a bit of filling along the edge where it meets. There is another tunnel on the other side but that should be much easier now. Other bits of photoetch are now going on and it is starting to look a bit busier. Trying to figure out exactly where they go based on the instructions and reference pictures takes up most of the time. Generally now have my laptop next to the workbench so I can check as I go along. Very slow progress at the moment and not much to show. The first part of the resin pieces has gone in though. These fit around the bottom of the first stage and annoyingly have to have a hole cut out for them as they need to sit flush with the surface. Unfortunately the plastic is very thick and doing this is quite difficult and getting them straight without making a very big hole is tricky. Not sure the one shown is totally straight but you would have to be really close to notice if it was crooked. So only 2 of them are in at the moment. You can also see that I have been around the base and marked everything up as to where it should (more or less) go. 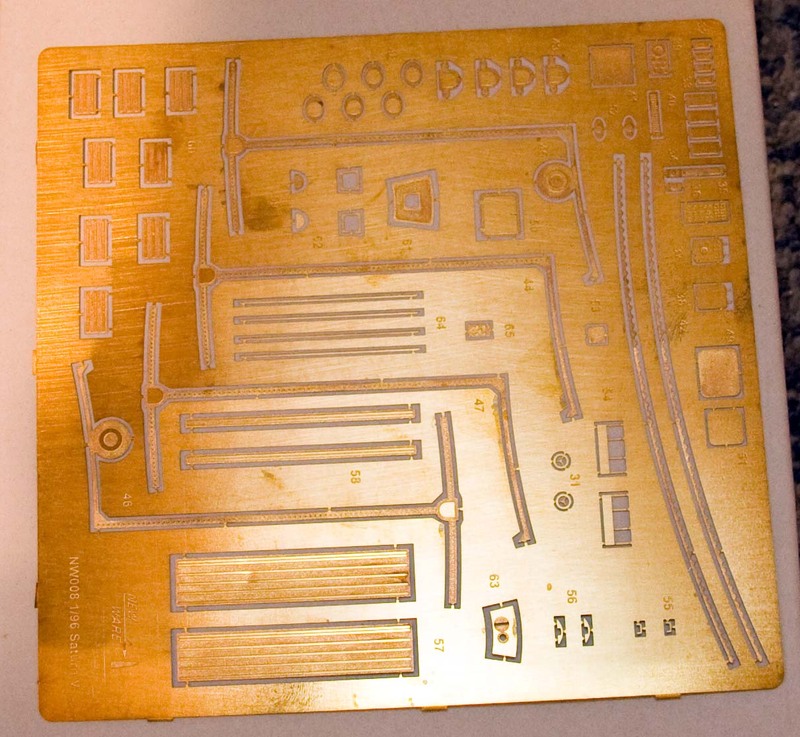 The 2 photo-etched parts are currently just blu-taked on. I need to check my references pictures to see if they should go on above the stringers or whether these need to be removed and them mounted flush to the surface. I’m sure it is the latter but best to double check first. So here is what I’m working with…. The model itself is the 25th Anniversary edition (already nearly 15 year old). The box is huge which gives some clue as to the size of the finished model, well over a metre long (3′ in old money, probably more like 4′). There are 3 real groups of parts. There are the plastic wrap pieces which are just flat pieces of plastic sheet with the relevant decals already printed onto them (I haven’t shown these because they are basically pieces of plastic sheet), the large collar parts and the detail pieces. This contains both brass photo etched parts and resin pieces. There are two sheets of photoetch. One of the big problems I will have (not having really worked with photoetch before) is how to fold them to ensure they fit properly and don’t gunk them with superglue). 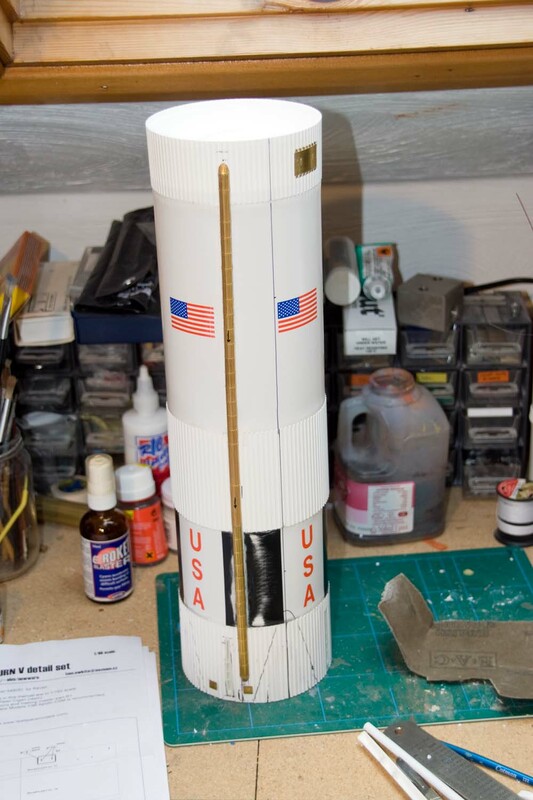 The first is mainly for detailing the stack itself with the connectors and other detail elements which are completely absent from the Revell kit. A lot of the second sheet is for the Command and Service Modules. 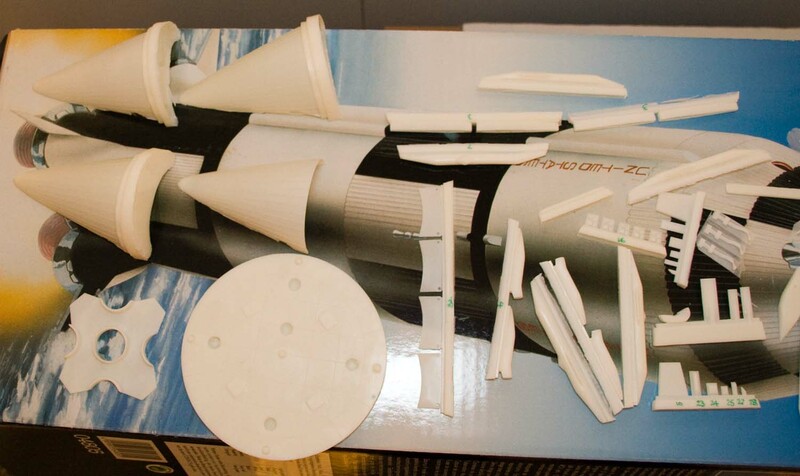 The Revell kit depicts a Block I version and all the manned flights where in Block II versions. So there are a number of elements which need to be altered and this provide the means of doing so. Then the resin parts. There are a big bag of these. 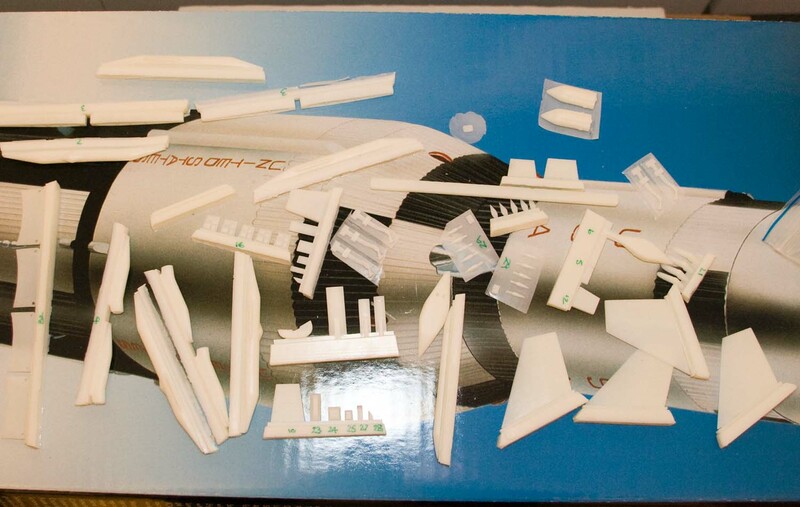 The largest are replacements for the cowlings around the bottom of the first stage. 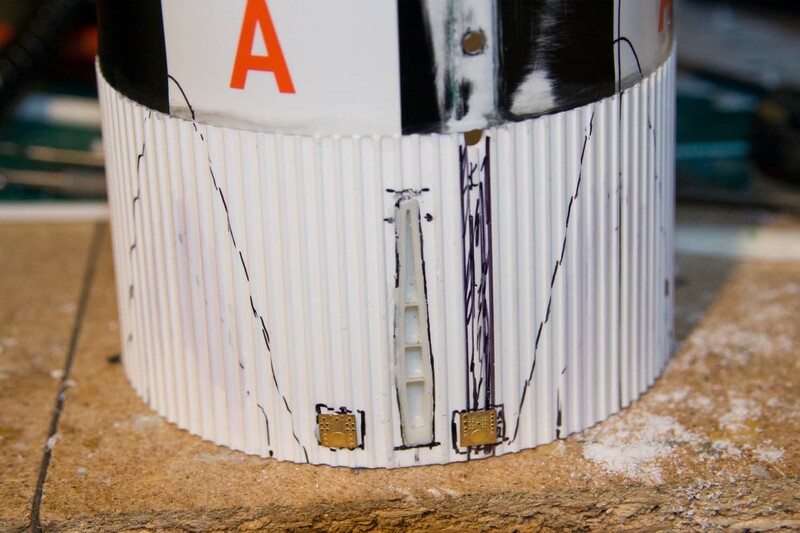 There is a replacement piece for the bottom of the first stage but in all honesty I prefer the detailing on the Revell part although I recognise that it may not be as accurate. 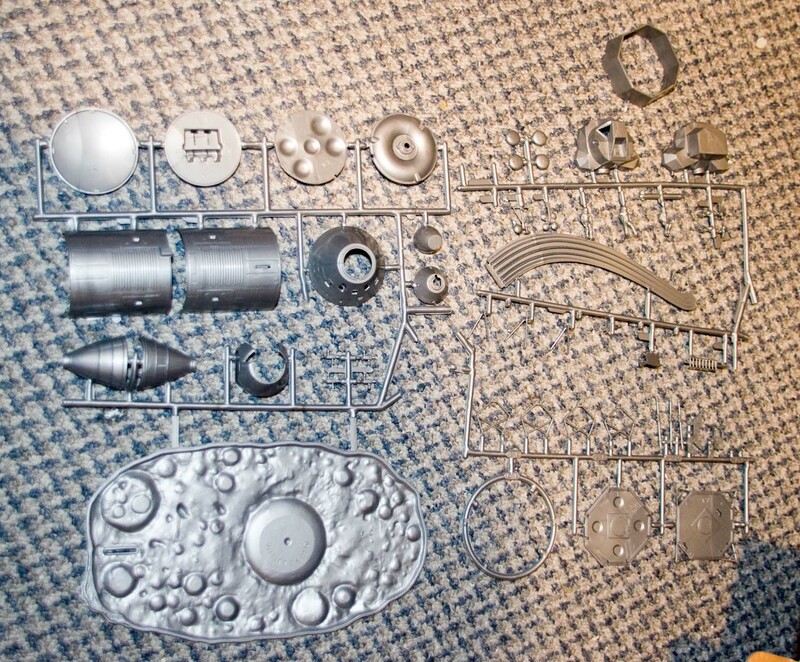 Then there are lots and lots of detailing bits, some of which are replacements for the Revell pieces and some of which are not represented at all. And the rest of them. Some are pretty small and need to be sanded off the sheet. Detailing overall is excellent on these and they are very crisp with very little (if any) flash. 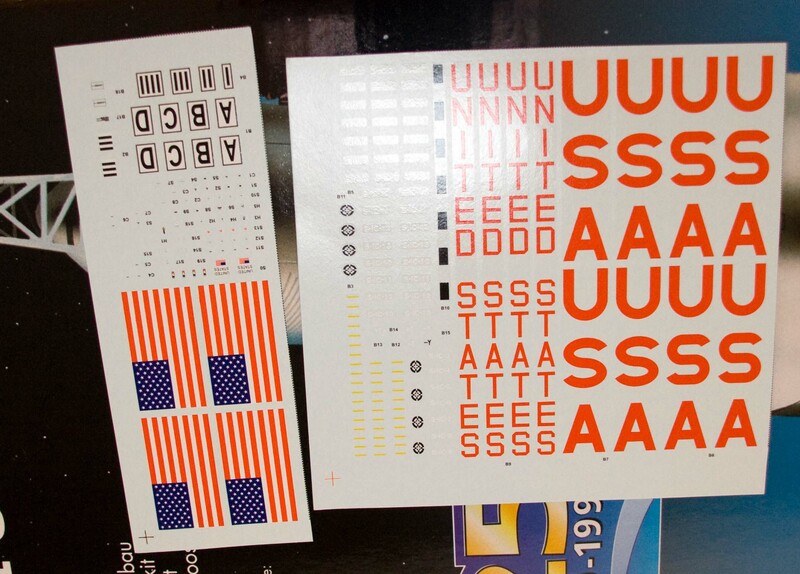 There are also decals which I got at the time which provide a great deal more detail than those provided in the kit. I understand that there are better sets available from Rick Sternbach but I ended up getting these ones as I was ordering it all at the same time. 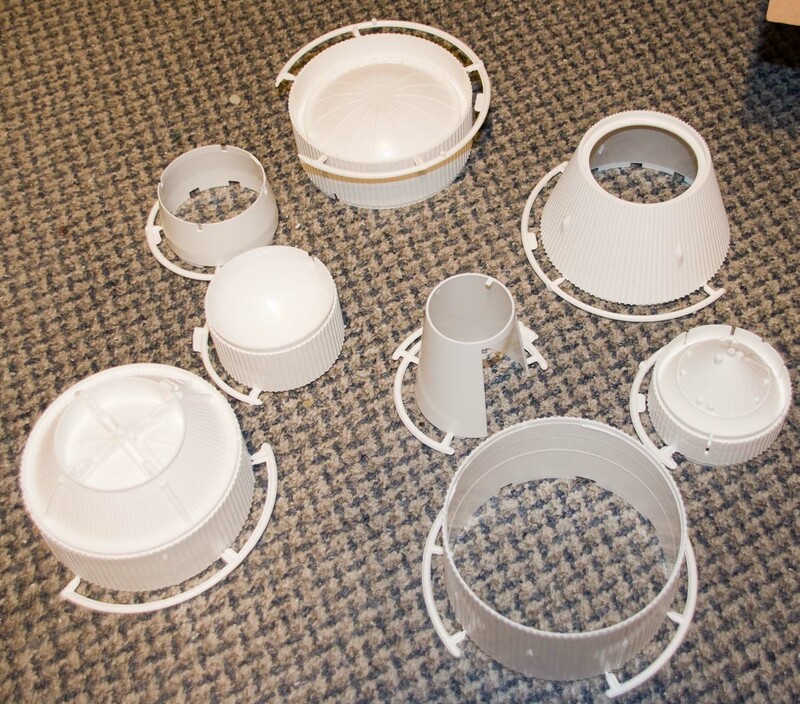 And finally there is a vacuformed Blast Protection Canopy (BPC) which is made by Real Space Models. 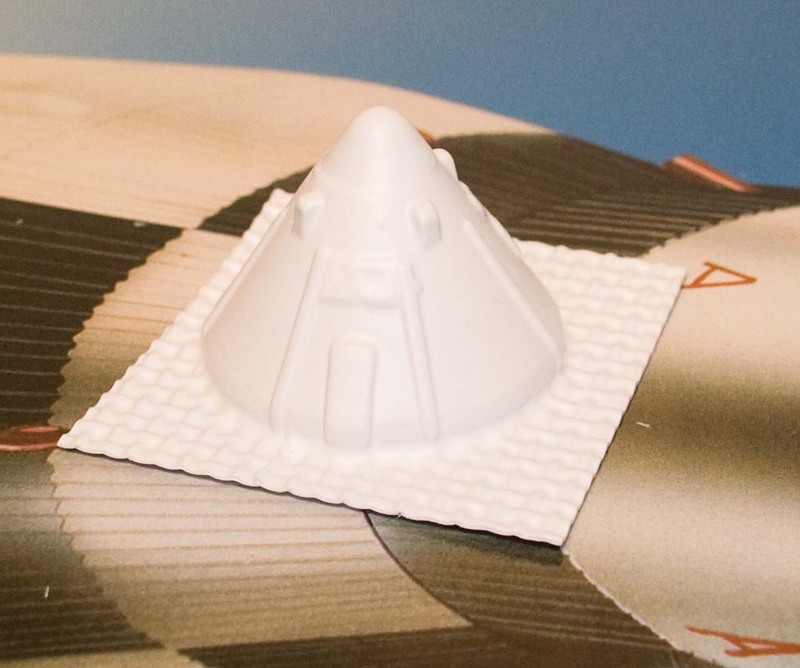 This protects the Command Module during take off and is a part which is completely missing from the Revell kit. This goes directly underneath the launch escape tower. So that’s the run down of the parts. Progress is likely to be slow over this very cold period but I still hope to get a few bits and pieces done during this time. Well some little amount of progress this weekend and made me realise that this is going to be a pretty big task. 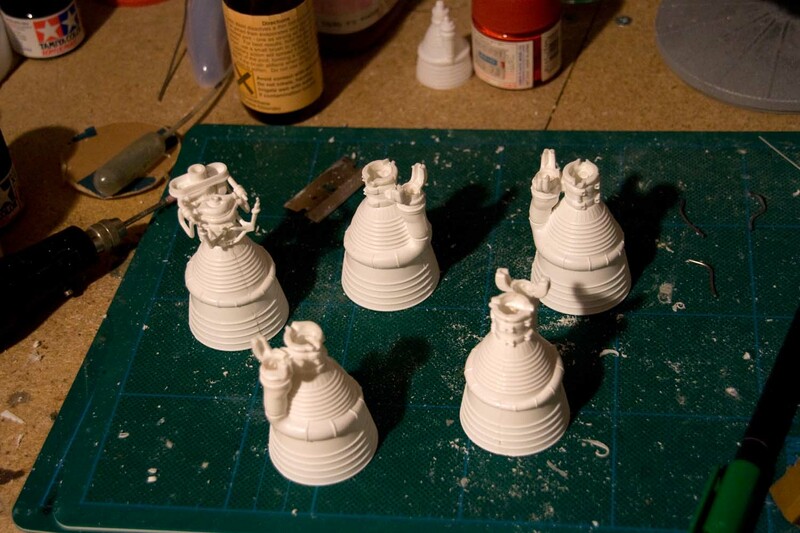 The remaining 4 F-1 engines were assembled, although the detail parts are still to be added. The inside needed grinding down a bit because there are injection points which will be visible in the finished model. Not a big job though. The next bit I started to work on was the first stage. This is formed by three complete round pieces which have the ribbing on them and 2 plastic sheet wraps. I suspect that the idea was to keep the number of big parts down and thus reduce the manufacturing cost. But they are a pain! But with a bit of care (the pre-drilled holes are in slightly the wrong place) and a bit of trimming to get the parts to join at the edge of the piping it doesn’t do a bad job. I had read about replacing these with plastic tube but sourcing the right size is not easy and it is very expensive. I did discover that either through misreading the (very vague) instructions or the parts being incorrect there was a gap between the piping parts. Not a big deal to correct and these will anyway be covered with photoetch for the New Ware detailing kit in due course. The ruler against the side is 12″ long to give you some idea of the scale of this thing. Well I’m going to finally start this build. I think I bought the kit a year ago (it may have even been 2) with a lot of excitement and then picked up the New Ware Models detailing kit at great expense. Now I don’t know what happened at the time but I never actually got started. I think the size of it was just a bit daunting. 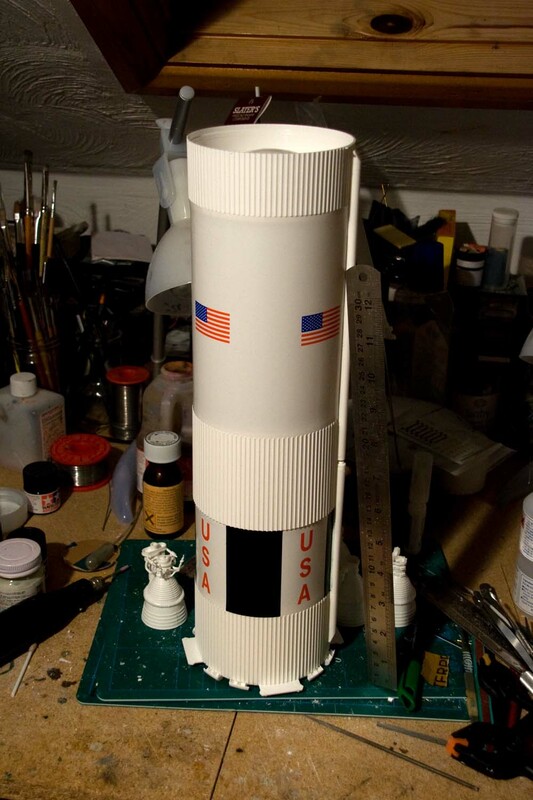 Well with the 40th Anniversary of the Moon Landings coming up (on 16th July 2009) I thought that this really should come out of the cupboard and see the light of day. It might also help me shake off a bit of a fug with model building at the moment where I start a project and just get bored with it very quickly. This time I have a definite date I MUST aim for and this time I’m going to get it done. Now having said all that I haven’t got very far so far. 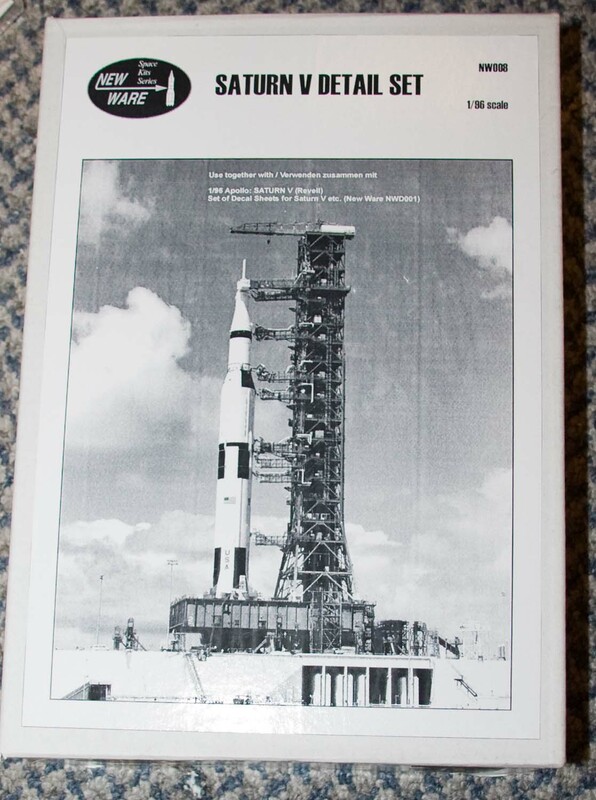 I had gone to start the Airfix 1:144 Saturn V and I think I might build them at the same time. 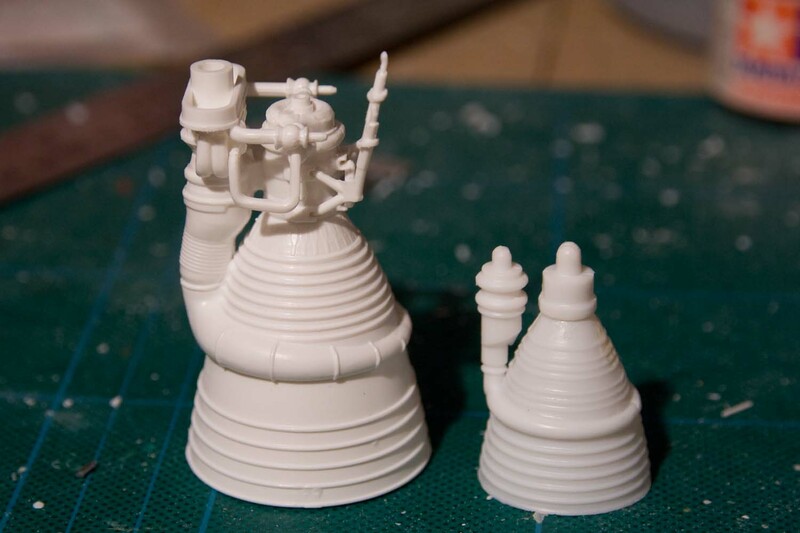 So here are 2 of the mighty F-1 engines which are on the first stage of the Saturn V.
Obviously the 1:96 one is on the left and the 1:144 on the right. There is clearly a lot more detail on the 1:96 ones but even that is not 100% correct compared to the real thing. However, I have decided that down that path lies madness and I will stick with the model part and just add some additional details, such as the small piping etc. The 1:144 one I will leave as is. So 4 more of them to do and we at least have some power….